- Fixed sporadic menu popups while using hotkeys - the old "Set BN_ConfigStart to 3" fix described in the Nexus comments is no longer necessary. - Removed debug texts that appeared in dialogue menus upon certain events like going to jail. - Removed water source reverse-replacement function, which wasn't working properly. 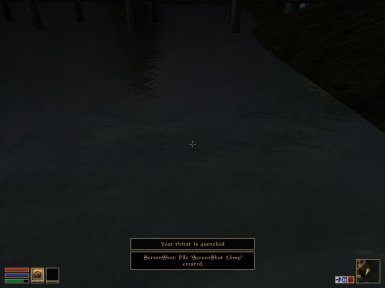 It is not recommended to uninstall The Bare Necessities mid-playthrough if you have used the dynamic water replacement feature in any version. - Dwarven well no longer provides water through the Dynamic replacement feature - most vanilla instances were used as conjoined architectural pieces, not actual wells. - Tent and bedroll items will now appear in more places throughout the world. - Thirst now damages 5 points of strenth by default (25 carrying capacity) per cycle, as opposed to 10 points in previous versions which many users thought was too punitive. - Addiction is now probabilistic at any level of drug consumption rather than definite beyond a threshold. Each unit of drugs taken temporarily raises the chance of addiction. Each 24 hour period spent sober reduces that chance by an equal amount. - Combined separate "Sleep and Shelter" and "Water Sources" files from previous versions into the main file to simplify the file structure. Do not use the old separate .esps with the new version. - Food, drinks, drugs, bottles, and water sources in Tamriel Rebuilt patches have been updated for new TR data structure. Current as of v17.09, and should remain compatible with future forseeable versions barring major changes to TR_Data. - Tamriel Rebuilt patch now edits certain TR water objects to provide water on activation. This still does not cover "static" water items, for which the dynamic replacement feature must be used, or a patch built manually. - Tamriel Rebuilt patch now adds tents and bedrolls to various containers and inventories of certain traders throughout Tamriel Rebuilt's mainland. - Morrowind Crafting patch has been deprecated. Since Morrowind Crafting has not been expanded to Tamriel Rebuilt, which is the main focus for compatibility, I will likely not release a patch for Morrowind Crafting in the immediate future. A simple needs mod designed to maintain maximum compatibility and blend in with the vanilla game. Unlike other needs mods that employ awkward container-based or automated eating methods, food and drink in this mod function just like any other item. To eat or drink, simply drag items from your inventory to your character or use their assigned hotkeys, just as you would to consume any ingredient or potion. Eat and drink regularly from a lore-friendly list of items or suffer penalties to key attributes, and even death. Sleep is also a necessity: you must rest regularly to maintain your wits and agility, lending gameplay an immersive rhythm. For adventurers who need to go long periods without sustenance in dungeons or dangerous situations, drugs such as skooma and moon sugar are powerful tools that can alleviate hunger, thirst, and fatigue all at once. However, they also carry risks. If used too frequently, your character may find itself addicted, plagued by withdrawal symptoms and fevered sleep for which the only cure is time or more skooma. Tend to your needs, gauge the risks of venturing out unprepared, and get ready to hunt, scavenge, and barter for your life. All features are modular and can be individually configured. REQUIRES MWSE v2.0 OR HIGHER: https://www.nexusmods.com/morrowind/mods/45468? The Bare Necessities is not guaranteed to work without these mods, properly installed as described on their Nexus pages. If you don't see "MGE-XE 0.1.0" in the top-left corner of the screen as the main menu loads, and "MCP 2.4" in the bottom left corner of the main menu, you have not installed these mods correctly. For users of Tamriel Rebuilt, foods added by that mod will provide sustenance with the provided patch. 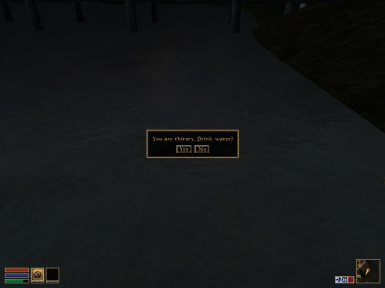 For users of Tamriel Rebuilt, drinks added by that mod will provide hydration with the provided patch. Fatigue applies penalties to Agility, which determines accuracy and dodging in combat, and Intelligence, which determines magicka capacity and regeneration. Penalties accumulate steadily each 12 hours gone without sleeping (adjustable). After going too long without sleeping, your character will begin to die of sleep deprivation, suffering constant health damage. The wearier your character gets, the more they must sleep to recover. Napping for over 3 hours (adjustable) will slightly decrease fatigue by 1 sleep cycle's worth of penalties. Full sleep for over 8 hours (configurable) will decrease fatigue entirely. Possessing an Extra Comfy Pillow decreases sleep requirements by 1 hour. Reaching full restedness may slightly fortify Agility and Intelligence. - Tents and bedrolls can be purchased from various traders, or found in containers throughout the world, including the starting areas of Seyda Neen and Balmora. - Tents and bedrolls can be obtained through the console by typing: "Player->AddItem BN_Bedroll_Packed ##" and "Player->AddItem BN_Tent_Packed ##." - For Tamriel Rebuilt users, the included patch adds these items to various places in Tamriel Rebuilt's mainland. - For users of Starfire's NPCs, an included patch adds these items to travelling merchants from that mod. This file requires Starefire's original mod (v1.11) and must be loaded after it. 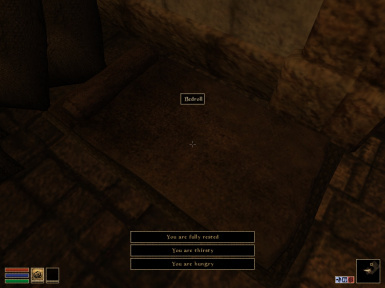 - For users of Morrowind Comes Alive, an included patch adds these items to NPCs from that mod. This file requires MCA (v8.2) and must be loaded after it. Skooma and moon sugar can be used to instantly alleviate hunger, thirst, and fatigue. Taking skooma entirely removes needs, while moon sugar erases 1 "unit" of each need. Consuming enough skooma or sugar within a given period raises your characters chance of becoming addicted. Once addicted, going too long without skooma or moon sugar will induce withdrawal. As withdrawal sets in, your character will suffer penalties to Willpower and Personality, and after a certain point will be unable to sleep. Withdrawal can only be cured by suffering through it for long enough (72 hours by default, adjustable), or by taking more skooma or moon sugar. Messageboxes and sounds will alert you when your character becomes hungry, thirsty, tired, or addicted. Message boxes and sounds can be toggled seprately. Needs and penalties are listed as active effects in the magic menu. - Vampires do not need to eat or drink, but still need to sleep. - Needs are suspended when in werewolf form, but will return to previous levels when reverting to human form. - Needs are suspended when in jail, except for skooma addiction: jail can even serve as an effective means to dry out without suffering penalties from sleep deprivation. - Water source replacement occurs dynamically as you traverse the game world; you will see the message "You hear the sound of a nearby well" or "You hear the sound of nearby water" each time a nearby water source is replaced (adjustable). - Scan frequency is adjustable: default frequency is once per indoor cell traversed and once per three outdoor cells traversed, or upon entering or exiting an interior location. - Alternatively, scans can be triggered by dropping the default wooden or metal bucket items in the world. - This feature can cause slowdown on lower-end computers, particularly in exterior areas containing numerous objects: users with older computers may want to turn down scan frequency or use the bucket-triggered method instead. 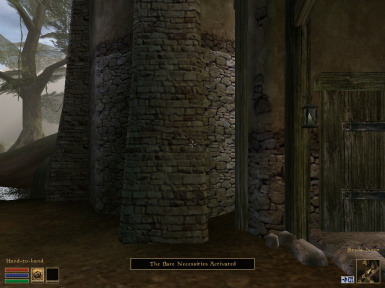 - Wells in vanilla Morrowind can be found in Pelagiad, Ebonheart, Dagon Fel, Wolverine Hall, and Skaal Village. - Wells in Tamriel Rebuilt can be found in most major settlements, and replacements use Tamriel Rebuilt's original meshes and textures. - Tamriel Rebuilt makes use of numerous "fake water" objects due to game constraints, particularly in areas of high elevation. These will also yield water when dynamically replaced. - Since dynamic replacement adds new objects to the game world and disables existing ones, it is not recommended to uninstall The Bare Necessities once this feature has been used in a given save file. - This feature is OFF by default. - Requires the Morrowind Code Patch v2.4+ as of v1.3. The only feature necessary for The Bare Necessities to function is the "Incorrect inventory sounds fix", without which the mod will not properly recognize when you eat or drink. - Requires MWSE v2.0+. Note that as of MWSE v2.0, MGE-XE must be installed separately for the extender to work. - FOR OLD VERSIONS PRIOR TO 1.2, INVENTORY MUST BE MAPPED TO RIGHT-CLICK (as in default settings) OR TAB (if so, use the "toggle inventory key" option present in the in-game config). - Ensure that TheBareNecessities.esp and any optional files desired make it into your Morrowind/Data Files folder. - Optional files include patches for: Tamriel Rebuilt, Morrowind Comes Alive, and Starfire's NPCs. Ensure that these files load after "TheBareNecessities.esp" and the original mods. - Those who had previous versions of the mod installed should make a clean save by following the instructions in the old ReadMe file per their previous version before installing and activating the new version. - Those experiencing difficulty uninstalling due to the "weariness bug" that plagued previous versions should download the fix by Alec127 (http://www.nexusmods.com/morrowind/mods/43718/? ), follow the uninstall instructions with that mod active, then deactivate and delete it with the other files. - Delete files from previous versions upon updating. The nomenclature of the files may change from version to version, so prior versions may not be overridden by dragging-and-dropping the new versions. 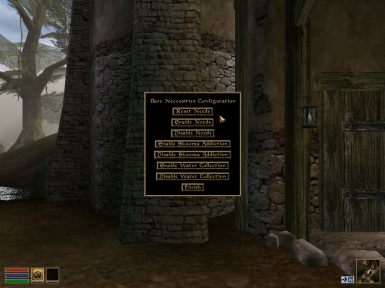 - Should be compatible with all mods, even other needs mods like Necessities of Morrowind and Basic Needs, though their functionality will be redundant. - The only vanilla objects affected by this mod are script edits to water sources throughout the world, and several miscellaneous "bucket" items optionally used to trigger dynamic water replacement scans. These edits can be safely overwritten by loading any other mods that affect these items below "TheBareNecessities.esp". 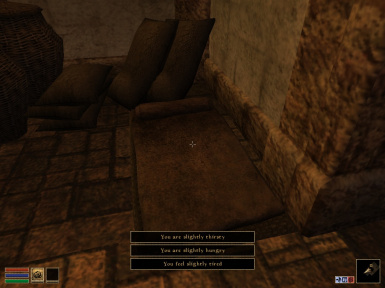 - This mod adds portable tents and bedrolls to the inventories of merchants and traders. These edits can be safely overwritten by loading any other mods that affect these items below "TheBareNecessities.esp," or by merging their inventories in a patch. - Food, drinks, and drugs from other mods besides Tamriel Rebuilt will not be recognized by The Bare Necessities without a patch. - As of version 1.3, items from Tamriel Rebuilt v17.09 are supported: patch files are included in the main download. 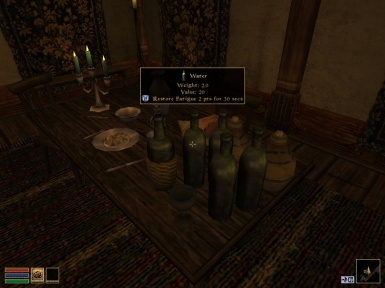 - While version 1.2 included a patch for Morrowind Crafting foods and drinks, this has been deprecated in the latest version. Since it required keeping separate permutations of the mod for those who did/did not use Tamriel Rebuilt, and since no patch exists expanding Morrowind Crafting systems into Tamriel Rebuilt, I will be focusing on Tamriel Rebuilt compatibility for any future versions. Users are welcome to upload their own patches for other mods without permission or credit. My apologies to those who used the patch. - Mods adding new instances of vanilla and Tamriel Rebuilt wells and water sources will be affected by the dynamic water replacement feature; however, patches will be required for other mods that add other new assets from which you would expect to get water, i.e. custom wells or waterfalls added by other mods. 1. You've installed the script extender and code patch wrong. Try reinstalling them. 2. You have a conflict. Try unchecking all your other mods and reactivate them one by one until this one works. If it still doesn't, try reinstalling the from scratch to remove other files that may be overwriting this mod. 3. You have found a bug in the mod. If you've tried all of the above to no avail, please post a bug report and I may try to address it in any future versions. If you devise your own fix, you are encouraged to post the solution here or to upload any separate files or patches you make (no permission required). - Open the in-game config menu and click 'Uninstall' to stop the mod. This will remove any active penalties from your character and deactivate any running scripts. Quit the game and uncheck "TheBareNecessities.esp" and any other optional files in the "Data Files" section of the launch menu. - For users of the Dynamic Water Replacement feature, deleting the .esp file will cause all water objects replaced in a given save file to disappear. As such, it is not recommended to uninstall The Bare Necessities after using this feature. - Given the wealth of ideas that have been expressed in the comments for changes and improvements over the years, and my own frequent hiatuses from modding, I want to ensure that others have the chance to patch and tinker with the mod and share their results. As such, permissions for this mod are completely open with regards to uploading and requirements: see 'Permissions' below. - Most basic parameters of the mod are now through Global Values accessible in the Construction Set, which I hope will encourage even script-phobic users to edit the mod to their tastes. I likely won't change any of these in any future iterations of the mod, so I encourage you as the user to go nuts and make it your own. - For those who wish to patch or adapt the mod, you will need to know the basics of scripting. Due to the mercurial nature of the Morrowind engine, even seemingly innocuous changes can cause unexpected problems with this mod's scripting. The documentation included in the download comes with detailed instructions about how to edit the mod without breaking anything. If, for example, I disappear from the Nexus right before a large Tamriel Rebuilt update that breaks compatibility, this is your best hope for getting the thing working again, and I would encourage you to share your results with the rest of the modding community. - Uploadable anywhere without permission. Patches and modified versions can be uploaded anywhere without permission and do not need to require the original mod.